The official UK singles chart is undergoing a shake-up to prevent one artist or group from dominating the majority of the top spots. The Official Charts Company's new rules prevent the same artist from having more than three songs in the top 100 at the same time. With the rise of streaming, charts have ended up reflecting how many times each individual song was listened to, not necessarily purchased. This means virtually every song from one album can end up dominating the top of the charts. 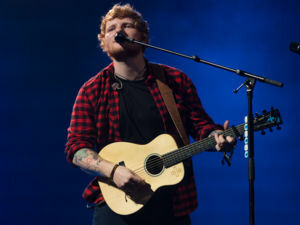 Sixteen tracks of Ed Sheeren's last album Divide appeared in the first 20 spots of the singles list, earlier this year. The phenomenon, while partly attributed to the artist's success, was also due to streaming metrics used by the company to calculate its charts. In December last year, after Drake's One Dance managed 15 weeks at number one, the conversion rate changed from 100 to 150 streams to a sale. The streams-to-sales ratio has been changed again as part of the shake-up in an effort to accelerate the removal of existing songs from the chart. As of 7 July, 300 music streams will count as one sale. According to the Official Charts Company, the changes will "ensure the chart continues to be a showcase for the new hits and talent which are the lifeblood of UK music". "This is not a chart for album tracks; we want to remain the Official Singles Chart, for singles," chief executive Martin Talbot told NME. "It's tougher than ever for new music and developing artists to break through, and this is us doing our bit," he added. "This is about injecting energy back into the chart." The changes have been agreed by record labels and streaming services across the industry.